Although simple to install, for best performance, please read the instructions below for your device to find the best placement. Step 1: Clean the back of your device with a clean damp cloth or use the alcohol pad wipe if supplied and thoroughly wipe dry. Tip: Before removing protective backing of the adhesive strip experiment placing the kickstand4u ™ mobile kickstand in different locations on the back of your device to help find the location that is best for you. The general rule of thumb on placement is in the "center" and 1/2" to 1" from the bottom of the phone. Diagrams A and Diagrams B show the kickstand blade locked in the 2nd notch position in all pictured examples, and the device angle changes where the kickstand is mounted on the the device, the option is yours. Step 2: After locating the place where you want to install the kickstand, remove the protective backing of the adhesive strip and carefully position it and "lightly" put kickstand4u™ kickstand in place in case you have to re-position it. When satisfied, firmly press and hold the kickstand4u™ kickstand to your device for 10 seconds. Maximum grip occurs within 36 to 72 hours. If you need to re-position the kickstand, simply use the "pull tab" to release. There is a spare adhesive in the package if needed. Step 2: when installing on tablets 7" and up, choose the correct link example below. Open the kickstand blade to it's 4th notch where the blade is at 90 degrees to the base. Place the kickstand4u™ mobile kickstand "center of your tablet" so that the kickstand blade is cut in both the horizontal and vertical plane of an imaginary "cross-hairs". 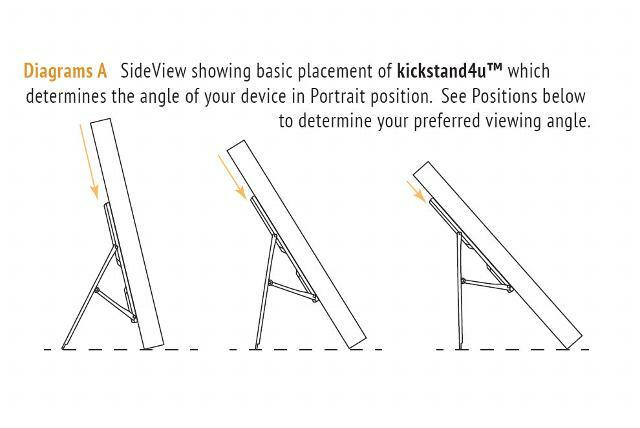 Doing so will assure that kickstand4u™ mobile kickstand will work in both the Portrait and Landscape positions. Once satisfied with the visual location where you will be installing the kickstand, remove the protective backing of the adhesive strip and "lightly" place kickstand4u™ kickstand in place in case you have to re-position it. When satisfied, firmly press and hold the kickstand4u™ mobile kickstand to your device for 10 seconds. Maximum grip occurs within 36 to 72 hours. If you need to re-position the kickstand, simply use the "pull tab" to release. There is a spare adhesive in the package if needed. Open the kickstand blade by "lightly" placing your thumb near the top of the kickstand while inserting your fore-finger fingernail into the small opening at the bottom to pull the kickstand blade outward while using your thumb to apply gentle downward pressure at the top to help the blade slide over the notches in a rocking motion. To Close the kickstand blade, simply "press" at the "very bottom edge" of the blade as shown below in picture below. This is a Side View of the kickstand in portrait position. Note, all three views are with the kickstand locked at the 2nd notch. 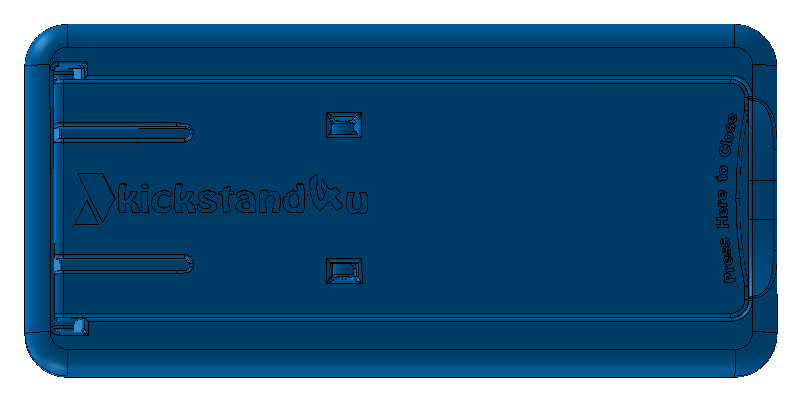 The further from the bottom that you mount the kickstand4u™ kickstand moving towards the top of your device, the greater the viewing angle. Simply experiment with the position that is best for you when adjusting for the vertical portrait position. Generally speaking, for Portrait positioning, mounting the kickstand 1/2" to 1" from the bottom and in the center of the device is best. This is a Side View of the kickstand in landscape position. Note, all three views are with the kickstand locked at the 2nd notch. The further from the bottom that you mount the kickstand4u™ kickstand moving towards the top of your device, the greater the viewing angle. Simply experiment with the position that is best for you when adjusting for the horizontal landscape position.